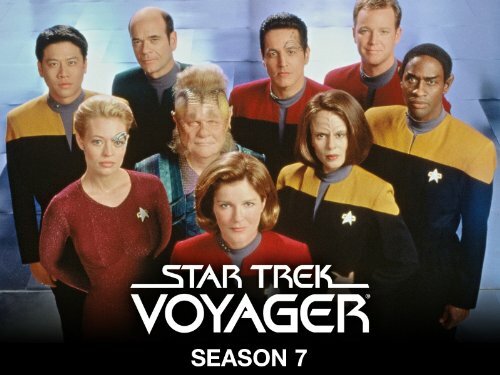 I think the final episode of Voyager season 7 truly takes the prize for best finale ever! One of my favorite things about watching the Star Trek series' is watching the crews grow, and learn, and discover their own potential. Seven went from being a Borg drone to being completely free of the collective and learned what it means to be human again. The Doctor explored what it means to be a sentient life form in holographic form, and even asked himself whether he would ever want to become human given the chance. Tom grew out of his rebellious ways, and even Tuvok learned to make friends even with the illogical Neelix. Season 7 wrapped up all the stories from all the main crew members and in the end every story ended in a satisfactory way. Seven of Nine found someone to have a relationship with. Tuvok got his cure. B'lana and Tom got to have the doctor birth their baby. We find out that Harry Kim may eventually become a captain of his own ship, and the Doctor may eventually pick a name for himself and perhaps even get married; all of this being up in the air of course since they rewrote time again but... check it out and you'll see! Yeah its all a bit Timey Wimey but we've also been keeping up with all the Doctor Who episodes so we are totally used to all that. I'd have to say the only thing I was disappointed by is the fact that 7of 9 didn't finish her codiscot game (or however you spell that) with Neelix, AND the fact that they left him behind. I am glad that he found the rest of his people and a family, and I guess if Star Fleet can communicate with voyager on the rare occasion than they can still keep in touch with Neelix too. So overall, unlike the series finale of 'Enterprise', I was very satisfied with the way Voyager ended. And I'm not the only one who loves Voyager! Author Travis Simmons has even gone against the typical geek grain and professed his love for Capt. Janeway on his blog along with a pretty well thought out list as to why he enjoys Captain Janeway over the other Star Trek captains! We've been dipping back into re-watching the episodes of Smallville from the beginning, and Breaking Bad (though the kids don't watch Breaking Bad with us of course). We are also anxiously awaiting the new season of Doctor Who, Green Arrow, and Walking Dead.